Wondering if your dog can safely eat apples? While your pup may be interested in anything you’re preparing in the kitchen, it’s good to be cautious about which “people” foods also make good treats for Fido. Fruits and vegetables are increasingly recognized as smart supplements to our furry friends’ regular diets, but that doesn’t mean all produce is equal or even safe for dogs. Fortunately, the answer is yes: apples are a safe, healthy and delicious addition to your dog’s diet. Therefore, next time you visit the grocery store (or an orchard!) pick up a few apples to set aside to slice up for your pup. While not all dogs will dig the flavor or texture of this low calorie sweet treat, many pups adore them. Not only do most dogs enjoy the sweet crunchiness of apples, but they’re also a great source of vitamin c, vitamin a, fiber, phosphorus, and calcium. And, if your pup will eat it, apple skin especially contains much of those healthy vitamins. It’s also perfectly safe to eat! Just remember to cut off and discard brown or rotten spots, just as you would for yourself. Like other fruits and vegetables, apples can also help with weight management. Meaning, when looking for a supplement to your dog’s regular diet, reaching for an apple can be a smart, low calorie choice. Given their health benefits, the occasional addition of apples to your pup’s diet will help build a stronger immune system. Can I Feed My Pup A Whole Apple? There is one drawback to feeding your pup this fruit. Apple seeds are not safe for dogs to eat, as they contain tiny traces of the toxic substance cyanide. While accidentally swallowing a seed or two is unlikely to hurt your dog, over time, the consumption of apple seeds could lead to poisoning. Thus, when feeding your dog apples, it’s important to always throw away the core first. In fact, given that the apple core is a choking hazard as well as contains unhealthy seeds, it’s best to cut the fruit into small pieces before serving. The hard stem should be removed as well! What If My Dog Eats Too Many Apples? Furthermore, just like humans, dogs can suffer upset stomachs or even diarrhea when fed too many apples—especially tart ones. (A.k.a. an apple a day will probably not keep the veterinarian away.) Therefore, it’s advisable to just use apple slices or pieces as occasional healthy treats. Or, supplement your dog’s regular diet with a bit of apple sprinkled in. Also keep in mind that raw apples are very different from apples that have been processed. Canned or jarred apples are often preserved in high fructose corn syrup and/or sugar, thus rendering them an unhealthy no-no for any dog. Likewise, applesauce also contains sweeteners, such as honey, sugar or corn syrup. Due to these additions, it’s best to stick to whole fresh apples or pre-sliced apples only. Can I Feed My Dog Apple-Based Treats? Feeling creative? If you’re in the mood to bake, fresh raw apples can be repurposed into homemade apple-based dog treats for your favorite pup. This recipe for apple carrot dog biscuits, for instance, calls for apples and carrots (of course) plus oats, eggs, and a few other ingredients. Or try these simple pumpkin apple dog treats, which combines two main ingredients that most dogs love. No time for making a mess in your own kitchen? Or maybe your pup’s not a fan of raw apples? No need to worry! BARK has an abundance of treats that might be more palatable to a non-fruit loving dog. From crunchy biscuits to freeze-dried, jerky style, or soft baked treats, BARK’s treats are all natural, delicious and conveniently shipped to you. (No mixing bowl or apron required!) While not all dogs are fruit-eaters, there is something here for everyone to love. 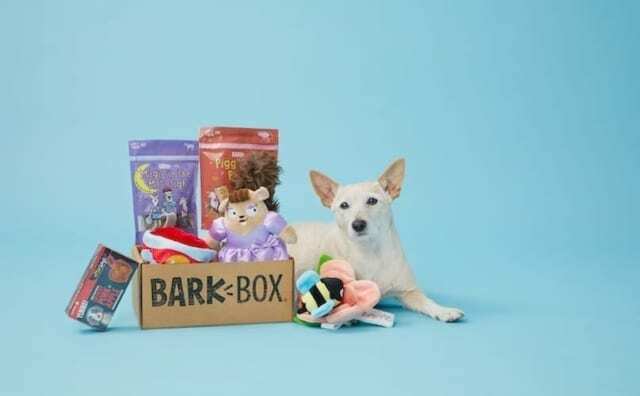 If your pup’s treat tastes go more to the crunchy biscuit/jerky-style/freeze-dried/soft-baked kind of treats and less to the fruit variety, consider getting them a BarkBox subscription! Every month, a box filled with 2 fun toys, a meaty chew, and 2 bags of tasty treats will be delivered straight to your door. And all for as little as $22. The post Can Dogs Eat Apples? appeared first on BarkPost.